Well, spring is finally here! Although I know many of us didn’t really have much of a winter, it’s nice to have spring here. 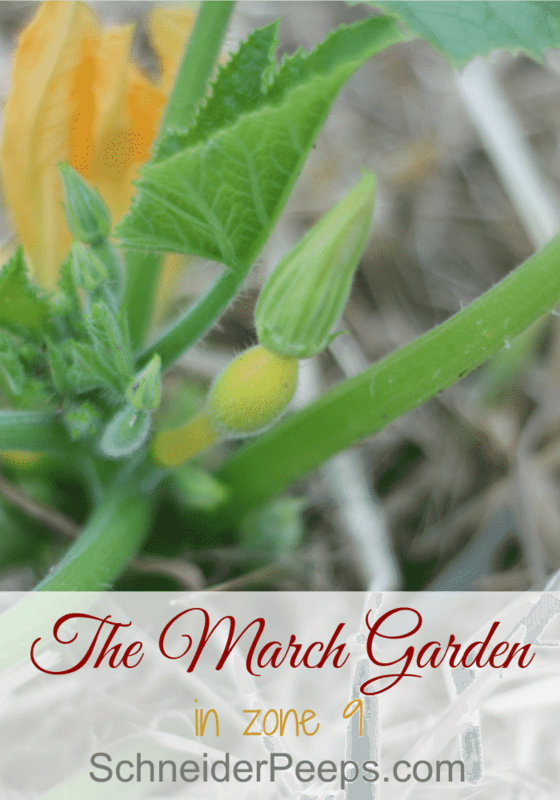 I’m finding myself lingering outside each day and “walking the garden” as we call it. Not really working, although I probably should be pulling weeds, but just checking on things and enjoying the progress it’s making. 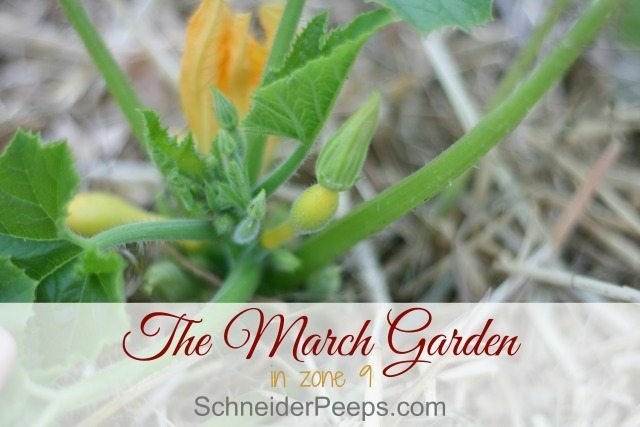 Here’s a peek at our March Garden. This, this is our mature lemon tree and a smaller one to the left of it. We have 7 citrus trees in this area and all but one are blooming. I’ve decided that we should put a small table and chairs in the middle of this little citrus orchard. It smells divine, sometimes I just stand there and enjoy the fragrance. 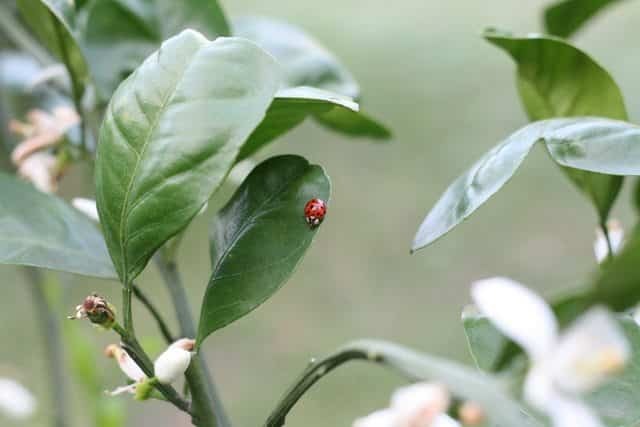 The lady bugs are enjoying the satsuma orange tree…. 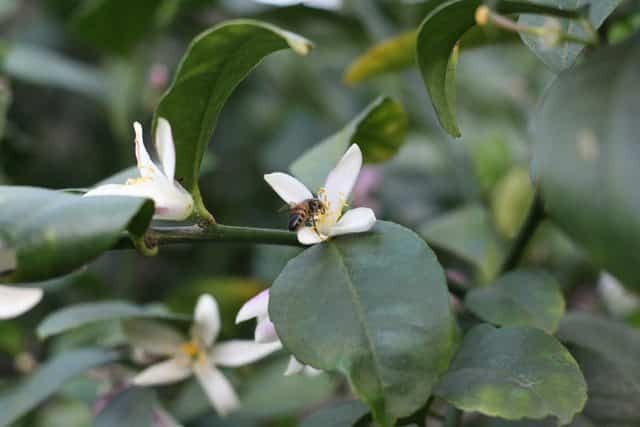 …and the bees are enjoying the lemon tree. 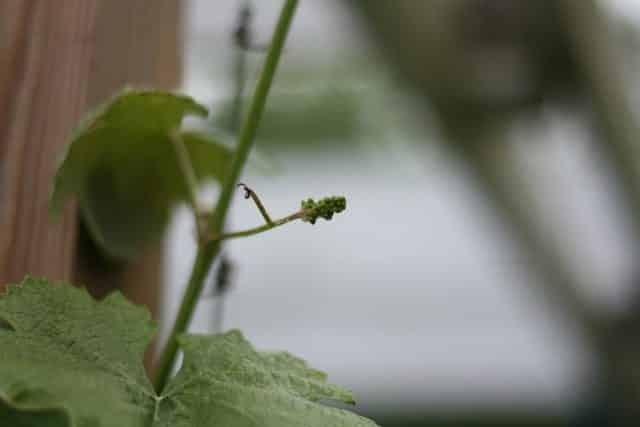 We have small clusters of grapes forming on the grape vines. 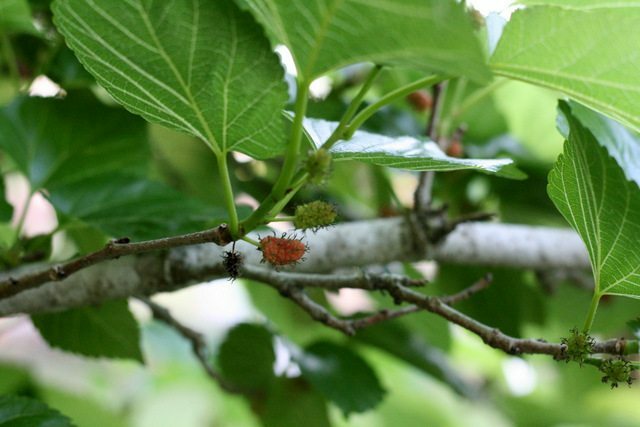 And the mulberries are starting to turn colors. I’ve caught Esther eating the red ones quite a few times, she just cannot wait for them to turn black. 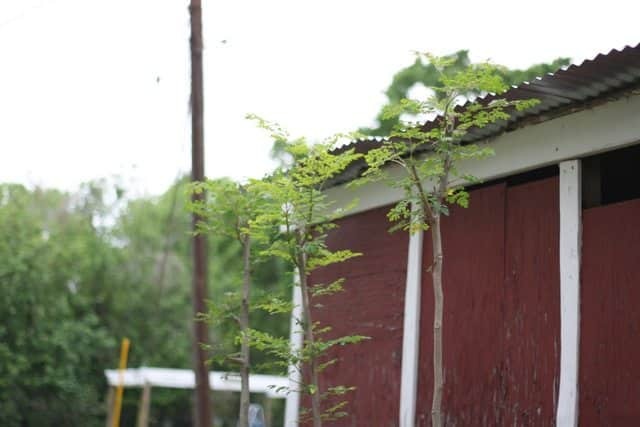 The moringa trees are bouncing back after being completely pruned back a few months ago. This is the tidiest you’ll see my garden all season. I wish it weren’t so, but I’m sure it will be. 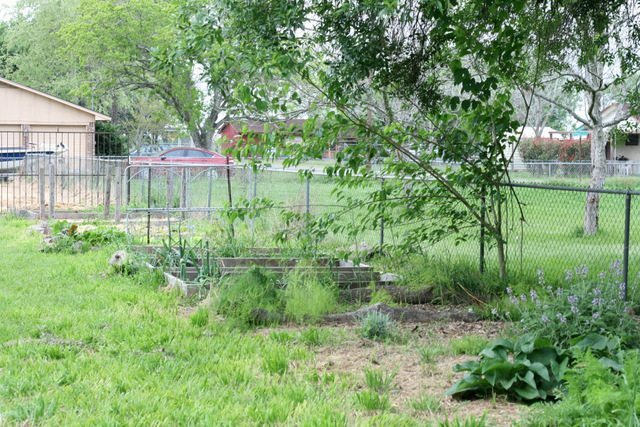 This is the left side of the garden. Our little herb garden is doing very well. We have comfrey, sage, thyme and lavender right now. I want to add a couple more lavender plants and some oregano, fennel and calendula. I’ve been reading this book on making your own skin care products and this one on gardening for bees and so the list of herbs I want to grow is a getting longer. I’m going to try to just a few new things each year. This is our lettuce and swiss chard bed. We planted some cucumbers along the trellis. My kids hate the lettuce I grow, it’s just too bitter for them. If you have a lettuce suggestion that is not bitter I’m all ears. It’s getting too hot for lettuce here but I will be sure to make a note of it in my gardening notebook. We’ve been picking strawberries all winter long. 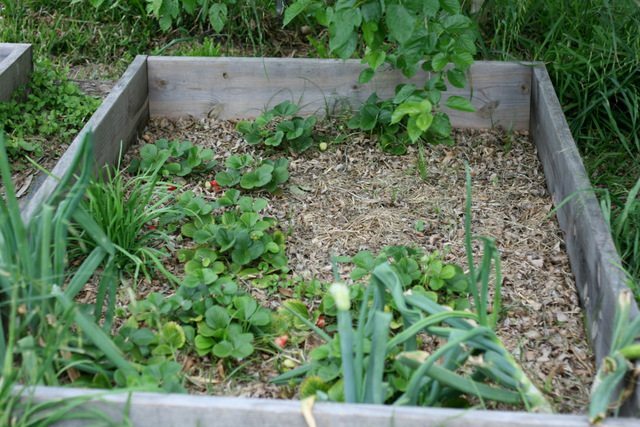 They’ve done so well that we added two more beds, one with everbearing strawberries like these and one with June bearing strawberries. I started these tomato plants on our front porch in early February. We have about 45 plants, I’m super excited to see how they all do. I decided to just use whatever seeds I had available and not buy any tomato transplants this year. It’s been an exercise in self control, I tell you. Quite a few of our beds have several different things in them. I’m learning to interplant and mix up our boxes some in order to make the most of gardening all year long. 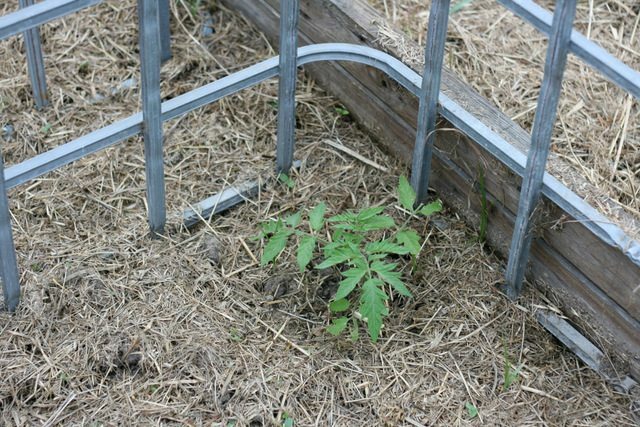 There were cabbages where this tomato cage is just a few weeks ago. These tomatoes are much bigger than the others because a friend started these in early January and had too many for her garden and shared with me. It’s nice to have friends like that. We don’t have enough trellises for beans. In the past we’ve grown bush beans and pole beans but bush beans just don’t do well in our garden. I’m sure I’m doing something wrong but I cant’ figure it out and honestly, it’s now worth it to keep trying. 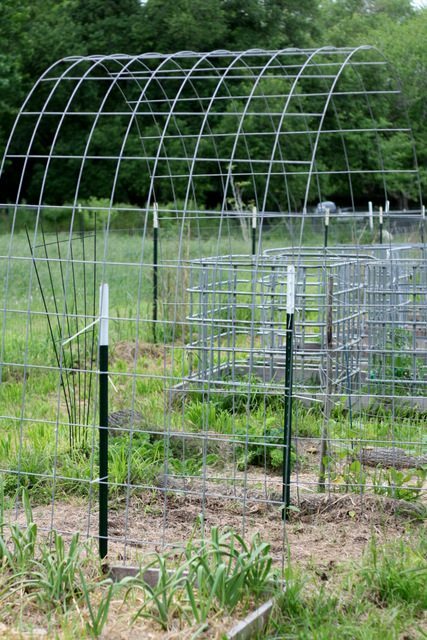 Pole beans do great, so we added a few more trellises. 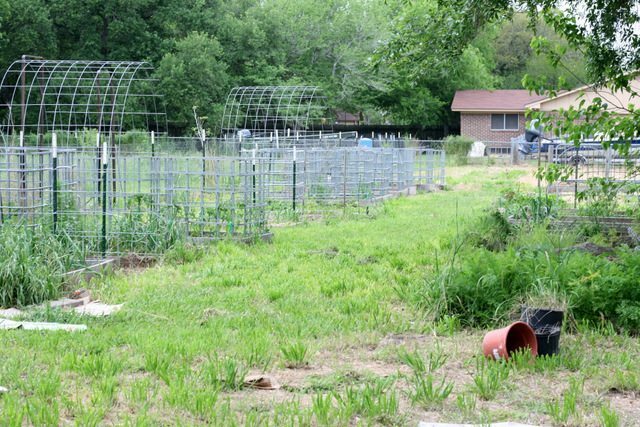 I wanted 8′ cattle panels and I was going to use T-posts to put them in between a few beds that were quite far apart. But Gabriel got panels that were much larger than 8′ so we made tunnels. I can’t wait for them to be covered with beans vines! 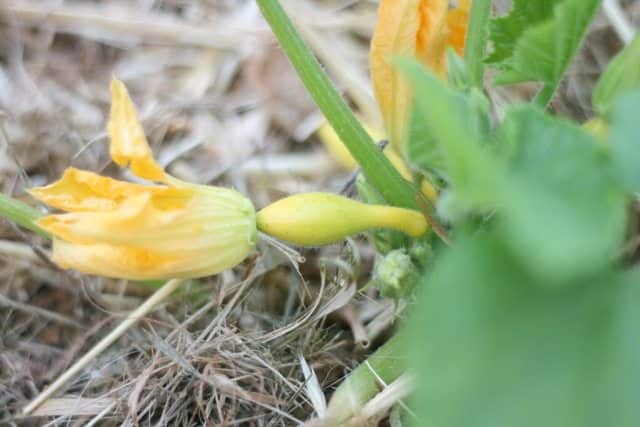 We have a few squash blooms! We’ve never had them this early and we’re all very excited. We’ve not had summer squash since last July and the kids are already requesting recipes. 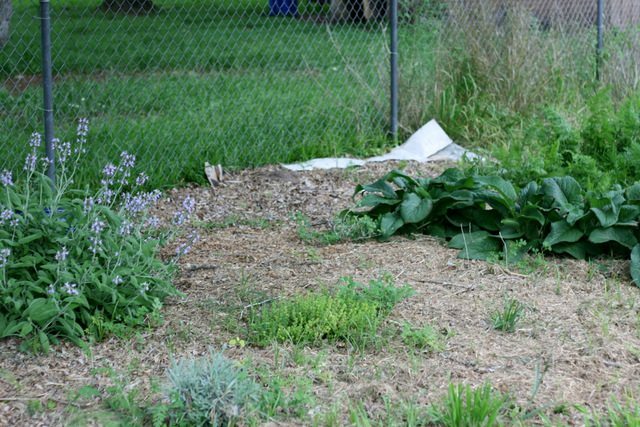 We’ve had a few mistakes already, somehow I managed to kill almost 40 melon transplants and 30 winter squash transplants when I put them in the garden and put straw around them, then the next few days were super windy and the straw buried the transplants….ooops. When we discovered it a few days latter, we pulled the straw off and planted a some new seeds. If the transplants don’t survive, hopefully the seeds will germinate and grow. But overall I’m super optimistic about our garden and orchard this year. Isn’t that the wonderful thing about gardening? It doesn’t matter what last year was like, each season is full of it’s own potential and wonder. So tell me, what’s going on in your garden? Nothing in the garden this year except volunteer plants. Volunteers are the best! Plus you have a new little one to keep you busy! 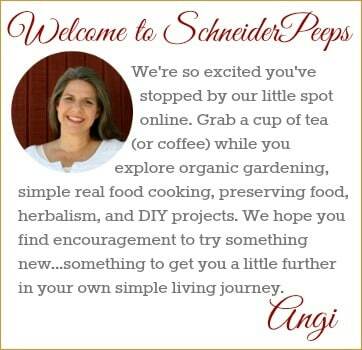 Hi Angi! Enjoyed reading about your garden. I’m still harvesting kale and carrots and peas, though I only managed to grow one beet this year. Already have my squash seeds in, and my tomatoes are just about big enough to live outdoors now. My lettuce did really well last year and this year we’ve been enjoying volunteers. 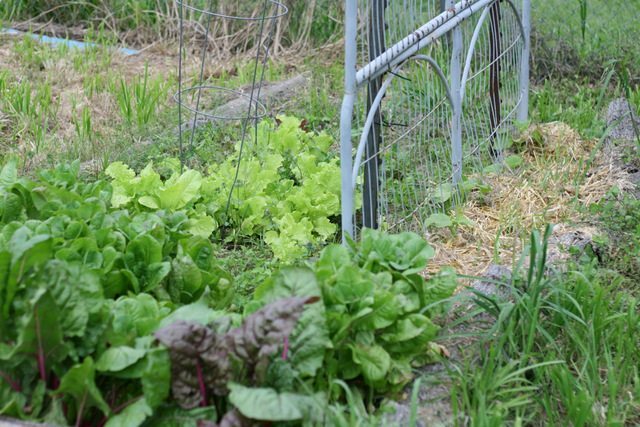 The only suggestion I have for lettuce is grow it in the shade of a climber like peas or cukes, water often, and harvest while still small. I grew leaf lettuce and just snipped off individual leaves as needed. Love just-picked lettuce, carrot & tomato salad! ? P.s. I am researching edible landscaping intensely. Getting ready to plant a loquat, but nervous because it can grow huge! My tiny subdivision yard would get buried! But loquats are certainly yummy, so hopefully worth the real estate. 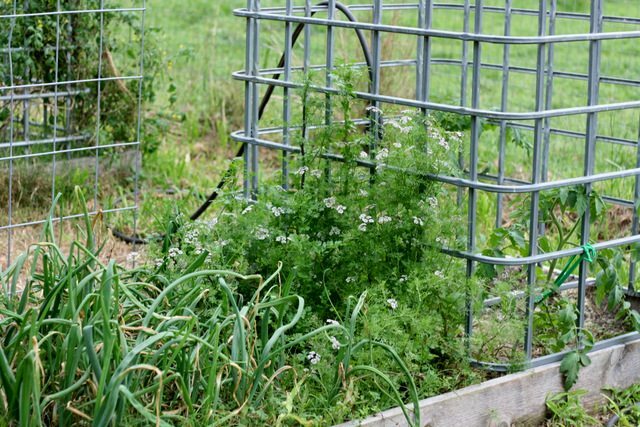 Wow, it’s amazing to see what is growing in your garden already! Here in the highlands of Scotland, the grass has not even started to grow yet! I have a couple of pea plants, potatoes, and some pak choi in pots in my polytunnel so far, but I don’t think it’s warm enough for more heat loving plants yet. Really liked your photo of the ladybird (as we call them), by the way! We had a very mild winter, even for us. I have a very romanticized idea of what living in highlands of Scotland would be like and your photos just helped feed that idea! I love that you call ladybugs “ladybirds”, I’m sure you’ll be planting those heat loving plants in no time. Thanks for visiting. Yesterday I ordered your gardening ebook, but I don’t see a link to download the pages. I got an email saying thanks for your purchase, but it doesn’t say anything about how I’ll get my book. Please advise, I’d really like to get started soon. 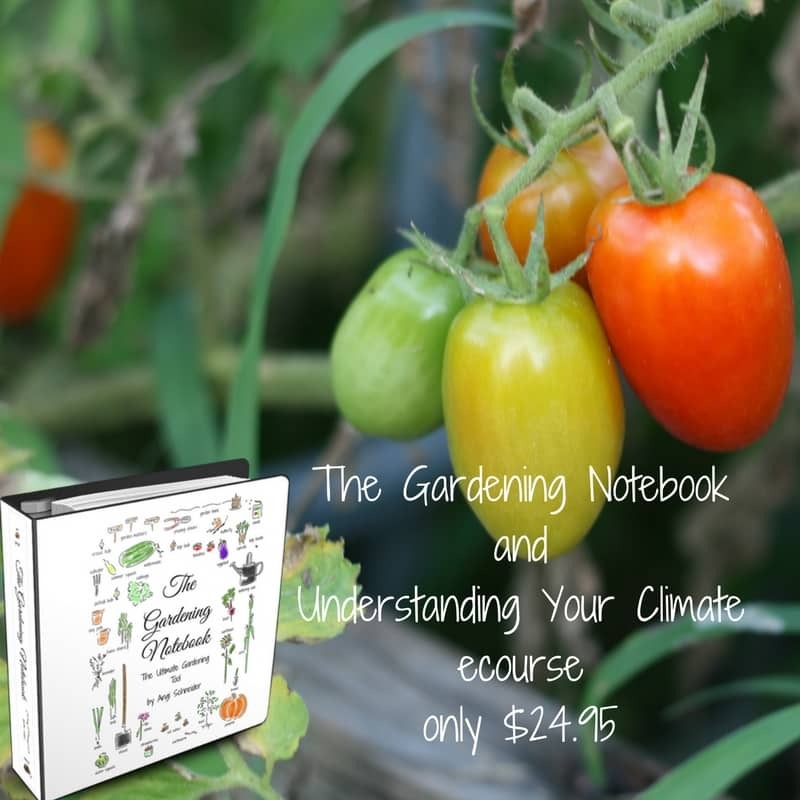 Thanks so much for purchasing The Gardening Notebook. I sent you an email last night with a new download link. I’ll send it again, please let me know if you don’t get it this time. Your garden looks fabulous. My cherry trees are just beginning to break bud. My apple trees are about two weeks away from blossoming. 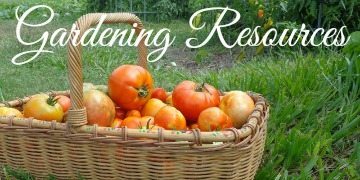 I was weeding the garden beds today in preparation for planting peas and lettuce. My rhubarb is about 4 inches high. I’m just so relieved that spring is finally here. Goodness, I bet you are! 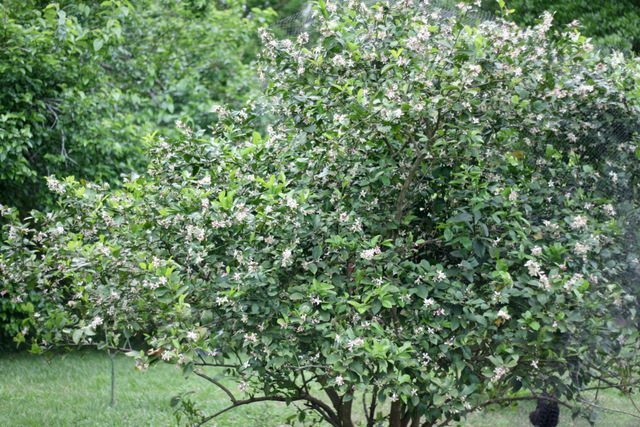 Your place must look lovely with those trees in bloom. I would really like to add a cherry tree to our property but we need to find a low-chill variety. Also, I’m pretty jealous of that rhubarb.